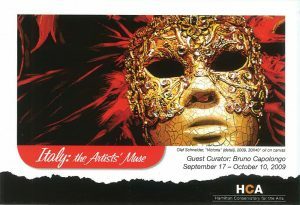 In association with Festitalia Corporation, and inspired by the Art Gallery of Hamilton’s year long celebration of Italian culture, the Hamilton Conservatory for the Arts Gallery (HCAG) and Hittie Gallery of Yorkville, Toronto are mounting a major Italian themed exhibition in 2009. Italy’s rich culture, architecture, landscape, and arts have inspired great art and design for centuries. This exhibition demonstrates and celebrates that influence.